← DNCB Outing No. 2016-36 on Boundary Bay Dike at 104th St. 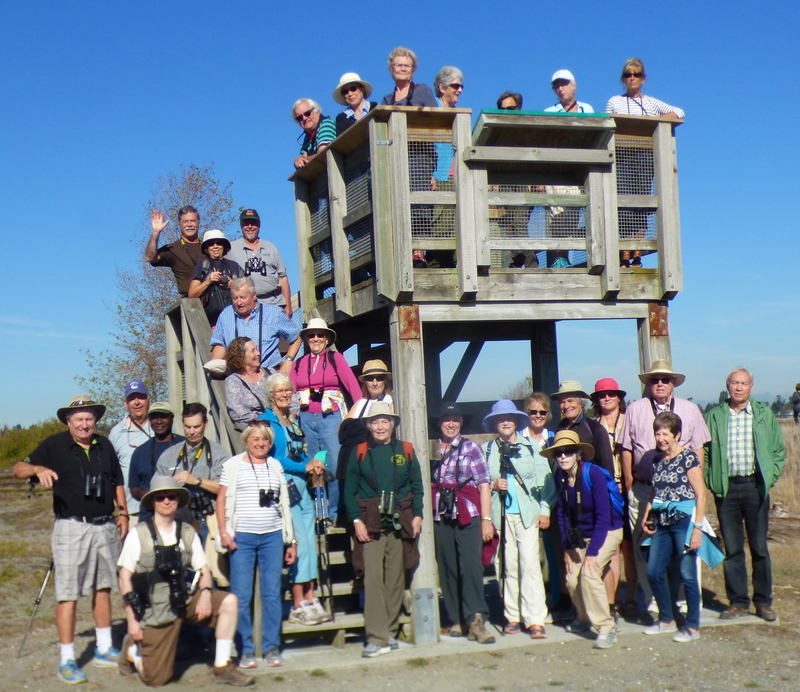 Under gorgeous sunshine this morning, we had more than 30 participants in our quarterly Birds on the Bay (BOTB) outing in Boundary Bay Regional Park (BBRP). Check out photos (soon I hope) on our new DNCB Flickr site. Also see this report and earlier reports and Delta Nats info on our website. At 9:00 am, we all gathered at historic Cammidge House (CH). Following registration of the newbies and several Langley Field Naturalists, Roger spotted a raptor in the tree behind the house which we finally determined was a Northern Harrier (white rump). Then we set out on our amble toward Centennial Beach. Some small birds were in the bushes by the slough at the end of the driveway, possibly Marsh Wrens and Common Yellowthroats. Some saw an Orange-crowned Warbler. The pond by the new native species garden was unusually devoid of birdlife except for one Mallard and a Brewer’s Blackbird on the mud shore. Following the usual frustration of “herding cattle”, we finally got everyone together for a Group Photo, taken by both Langley Anne G and Roger. At the beach, the tide was way out and we saw no shorebirds. In the distance were rows of ducks, we think were American Wigeon, Green-winged Teal and Mallards, with lots of Canada Geese too. Several Great Blue Herons there too, but interestingly, I didn’t see any Bald Eagles in the Bay today. Most have gone fishing elsewhere in the province. Newbie Langley Ralph (my new BFF) carried our priceless Scope and it was very helpful, but we still couldn’t ID the far out waterfowl. We could identify the small flock of Cedar Waxwings in the Willow tree. We heard a Greater Yellowlegs calling, but couldn’t find it. Fortunately, we saw about 10 later in the 12th Avenue lagoon by the Pump House. Leaving the beach, a Peregrine Falcon flew by, giving some of us a bit of a thrill. We continued our walk along the trail, seeing Anna’s Hummingbirds, House Finches, Spotted Towhees, White-crowned and Song Sparrows, and trying to avoid being hit by the many cyclists. Regarding the latter, we were 99% successful, the one crash scaring the cyclist more than the DNCBer. Understandably, it’s very difficult for a cyclist to avoid a disjointed convoy of 30 aimlessly chattering birders whose least focus is on other traffic on the path. At the Lookout Tower, we herded the group again for another photo; this amusement took the sting off not seeing many birds this morning. Another Northern Harrier glided by, and we saw a Savannah Sparrow in the dunes. At the Pump House a flock of Canada Geese and Mallards were close to shore. We picked out a Greater White-fronted Goose among them (Bird of the Day for some) and we could see it clearly, especially through Ralph’s Scope. House Sparrows were around, but since the tide was still way out, no shorebirds, other than the 10 afore-mentioned Yellowlegs. We dreamed of seeing the Black-necked Stilt which for the last few days has been just across the Bay at 64th Street. We took the inland trail back to CH, walking briskly to ensure 11:30 am arrival. Some saw Downy Woodpeckers, a Northern Flicker, American Goldfinch, Barn Swallows, and a Song Sparrow that was almost an early-arrived Fox Sparrow. Of course, Roger was the only person to see a Merlin flypast, and he searched in vain for the Yellow-breasted Chat (seen several years ago). We got back to CH almost on time where the Delta Nats Ladies, Elizabeth, Jean and Jennifer welcomed us with a scrumptious array of home-made goodies. When I arrived, there was only one of Sandra’s legendary Egg Salad Sandwiches left. And Jennifer’s Scones, both cheese and sultana, and Elizabeth’s Double Chocolate Cookies, Blueberry Squares and Shortbread were wolfed down quickly by the starving scavengers. I often wonder whether the large attendance at these BOTB events is to see the beauties of Nature in our paradisiacal Boundary Bay Park, or for the DNS Ladies’ Goodies. Another awesome BOTB event. Next Wednesday, September 21, we will leave Petra’s at 7:30 am for Blackie Spit (Tide is favourable). We expect to meet at the Spit parking lot around 8:00 am, and perhaps do Elgin Park later in the morning. Note this change from the Destination Schedule on our website. This entry was posted in *DNCB, BBRP, Birds-on-the-Bay, Boundary Bay, Centennial Beach, Greater White-fronted Geese, Merlin, Northern Harrier, Orange-crowned Warbler, Peregrine Falcon. Bookmark the permalink.